LIBERTYAIR provides professional service and repairs for natural gas furnaces throughout Gainesville and the greater North Central Florida region. Installation of new furnaces, regularly schedule maintenance checks, cleanings and repairs are all a part of the quality service you can expect from our technicians. We also provide emergency gas furnace service and repairs, so call LIBERTYAIR for convenient and reliable service. We can handle all gas furnace installation, services and repairs! Gas furnaces are known for their tremendous heating efficiency. Natural gas furnaces can heat air up to 25 degrees warmer than other types of heating systems, so the air coming out of your vents is warmer, and it takes less time to heat your home. Furnaces heat the air through the natural gas combustion in the burner. The heat that is produced during this process is funneled through a heat exchanger, where the air return duct blows. The air is heated over the heat exchange and distributed throughout your home. Homeowners often opt for gas furnaces because they are relatively reliable. That means your home can be easily heated anytime you need with minimal wait. If you’re choosing to have a gas furnace newly installed, rely on the professionals of LIBERTYAIR. Our technicians are experienced in installing gas furnaces of all major manufacturers. When should you call the professionals? If you’re installing a gas furnace in a home that did not previously rely on natural gas heating systems, or if you need to relocate your furnace, contact a professional. Always make sure your gas line is turned off before performing maintenance or repairs for your own safety. As with any appliance that runs continuously in your home, a gas furnace should be regularly maintained to ensure it remains working properly and efficiently. General maintenance includes cleanings, changing the air filter, cleaning the ductwork and checking all the moving parts. We recommend having your furnace serviced at the beginning of the cold season so that if there is a serious issue, your home and family won’t be without heat. It’s also a good idea to have your furnace serviced after the cold season is over. Many furnaces are overworked during the winter, then left to sit for Florida’s long summers. By the time the nights cool off again, your furnace may be in dire need of TLC. Don’t let your furnace sit with debris and residue buildup for months on end. Instead, have your natural gas furnace serviced in the spring or early summer to ensure it will be working properly next winter. Did you know that having your gas furnace regularly serviced can prevent damage and limit the need for repairs or replacements? The efficiency of a furnace is rated through an Annual Fuel Utilization Efficiency (AFUE) number. This number or rating stands for the percentage of energy in fuel which is converted to heat. A higher rating number results in more energy being converted to heat, which also means the equipment is more energy efficient (less energy is being wasted). 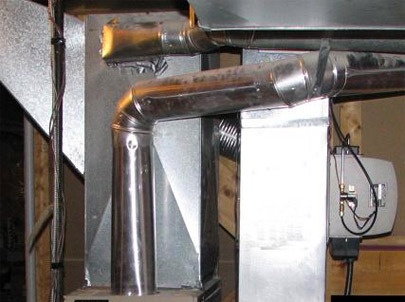 Natural gas furnaces can reach AFUE of 90 percent or more! Newer models can have a higher AFUE rating, but they also tend to cost a little more. One drawback to a gas furnace is that it does not provide cooling. In Florida, many homeowners prefer to use a heating and cooling system that can be used year round. However, it is not uncommon for homes to include a gas furnace and a separate air conditioner. Some homeowners may complement their furnace and A/C units with a heat pump to increase energy efficiency in the home. However you choose to heat and cool your home, you can rely on LIBERTYAIR to provide excellent customer service, professional installations, thorough maintenance and the highest quality of repairs in Gainesville.